When faced with months to live, how do you say goodbye? Wise words by the always welcome Alan Watts. | We followed teenager Shane Flowers as he weaved through the protests, attempting to let his voice be heard and fight for change with darkness slowly falling on Florissant Avenue. As he moves through the crowds, he hears differing opinions from other protesters on the best ways to fight for change. What good is justice, if it isn’t given to everyone? I came across the video above while reading the illustrated version by Zen Pencils, and thought a lot about the importance of taking steps that matter. Courageous steps, are often really difficult to take, but are also the ones that take us the farthest. Crazy, right? While we do usually post up videos here on SN7, I’d like to think that the enveloping theme consists of media that matters. With this in mind, I decided to take a different approach to today’s post. I came across this story today while on a treadmill in New Jersey, watching a news broadcast about a story in Australia. 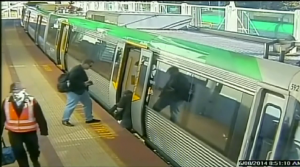 During today’s morning commute on the other side of the world in Perth, a commuter got his foot stuck in the gap that lies between the train and the platform. Naturally, people started to gather and watch as workers tried to pull his foot out, with no luck. What amazed me was their response. 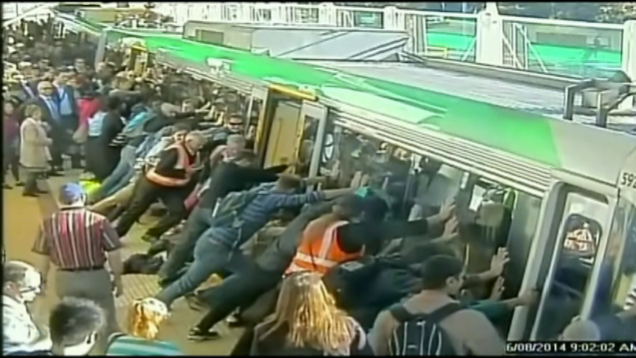 Not one or two, but what looks like almost 100 people jumped to action and were able to push a 70,000 subway car to free the man’s foot. In the middle of everybody’s busy morning commute, there was still time to come together as a community for a single purpose. Humans sure are a remarkable bunch. Salvation mountain, God is love. Have a great weekend folks!